Long story short: the good news is that at least one other copy of the Beyond This Point be Dragons manuscript has turned up - in the possession of Mark Bufkin's daughter Heather. The bad news is that according to Heather, it is missing the same pages as the Keith Dalluhn copy. (I can't verify that they are exactly identical, but am hopeful Heather will forward a pdf when she is able to make a copy). 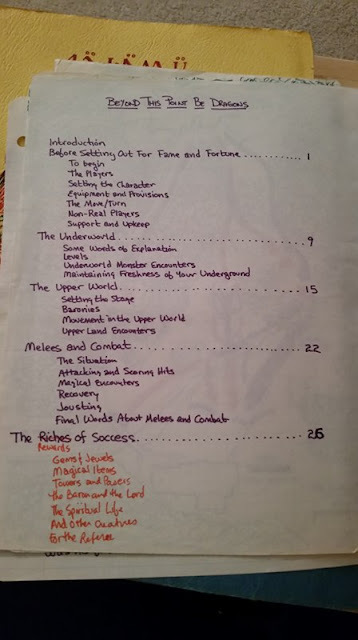 There is more good news however, Heather has a lot of her dad's gaming materials including a key outline of the manuscript I'll share with you below. Here for your enjoyment are some excerpts from Heather from our ongoing conversation. "Dad was a Twin Cities native who moved to Duluth in his senior year of high school. I don't know if he had any gaming history in the Cities prior to college. When I was in high school and got into roleplaying, Dad proudly gave me all his old materials, including this manuscript, which yes I still have. I remember him telling me one of his gaming buddies was from Wisconsin and friends with one of the D&D creators, and they playtested an early version of the game, but didn't particularly care for some of the structure so they wrote their own version. 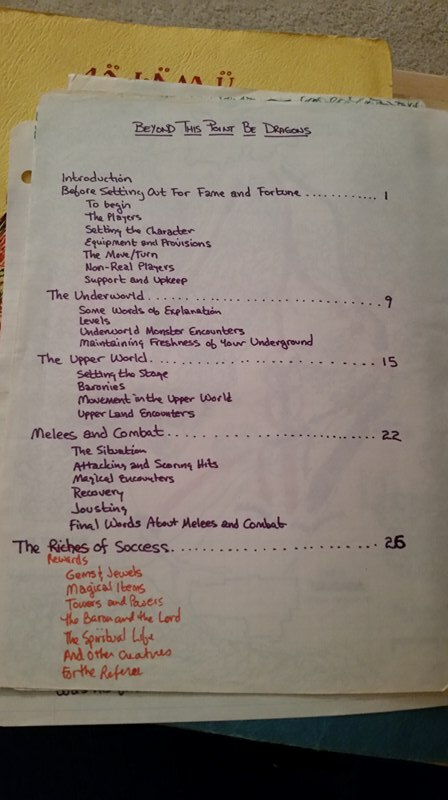 I was sure the one in the pink binder, the one you're talking about, was his adaptation, but then a couple years ago I spotted an image of the cover on a display board about early D&D and assumed it was the playtest draft instead. I guess it turns out it was Dad's after all. So, bad news. The copy I have is exactly as incomplete as yours.... From some of the other materials I found, it seems possible BTPbD was never finished. I remember asking him about the artwork and he said one of his friends did it. He did draw the maps, however. A LOT of maps. I have all the originals and they're very detailed, Tolkien-esque work. He was a big LOTR fan as well as C.S. Lewis; he read the Narnia books to me as I was growing up and they were indeed one of his favorite series. Actually now I'm second-guessing myself. He might have done some of the art; it might only be one particular piece that he didn't (or did) do. I saw some speculation on linked pages that there might have been another typist, but Dad was a newspaperman, news editor of the Statesman at one point, and made a lot of his own posters and things, so I'm certain he typed and put it together himself. It's some of those posters that's making me hesitate to say he didn't draw any of the art, although he might have asked his artist friend to do those as well for all I know. This is incredibly awesome and I'm happy to share what I can with the community. Dad would never have imagined there'd be so much interest in something he threw together in college. Thanks again for contacting me." I think it is very important to note what Heather said about "not caring for the structure" of the D&D game as he knew it. It is evident from what has been revealed about Gygax's "Guidon D&D" draft, that it was structurally a bit of a mess (a characteristic, not coincidentally, the printed version of D&D is also much criticized for). Mark Bufkin, being a journalist, evidently chaffed at the poor organization of the text to the extent that he was motivated to reorganize it himself, and in the process, rework any dependencies on polyhedral dice to standard six siders - as Chuck Monson had explained. The bulk of the text of BTPbD is otherwise unchanged from that of GD&D (with a number of interesting exceptions to be sure). In fact I think it has always been clear that BTPbD is distinctively well organized and appeared to be a distinct and deliberate branch of development, as I've said from the start. While it was argued by some that the structural and textual improvements in BTPbD could be explained away as part of the normal "churn" of an intermediary draft prepped by Gygax, that conclusion seemed more wishfully than factually based. It seems Heather's comments cement what we already know about the manuscript, that its creation involved a strong motivation for reorganization. There's several things to note here. Let's start with the heading titles and page numbers - they match exactly those of the manuscript, including the missing illustration on page 22. Another thing sure to be noted is the fact that we now know what sections were intended to follow "The Baron and the Lord", which is the last section in our existing copy of BTPbD. This included a section for the endgame of Clerics, a discussion of "other creatures" and more notes for the referee. It seems likely these were never actually written, but perhaps a bit more digging will let us know for sure. One clue is that these sections were added to the outline with an orange pen, and probably indicate the plan of a work in progress, as if the outline had been made just prior to the completion of Page 28 - The Rewards of Success illustration. In any case this new information helps us really nail down the intended scope and purpose of Mark Bufkin's revision.